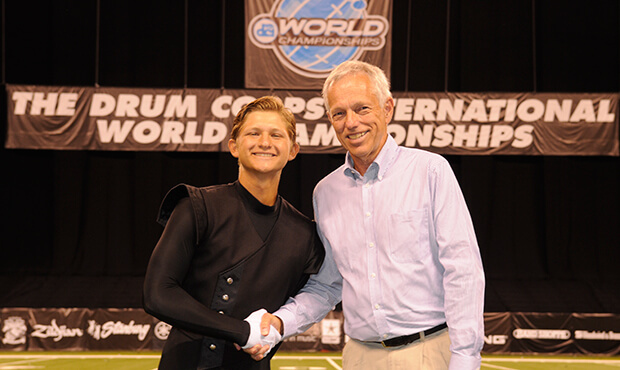 DCI Hall of Fame member Gene Monterastelli congratulates Genesis drum major John Filippone. More than a dozen corps members representing 13 different drum corps were recognized and awarded scholarships at the 2014 DCI World Championships in Indianapolis. The following awards that provide thousands of dollars worth of educational funding to worthy drum corps students, were presented at the conclusion of the DCI World Championship Semifinals at Lucas Oil Stadium on Friday, Aug. 8. 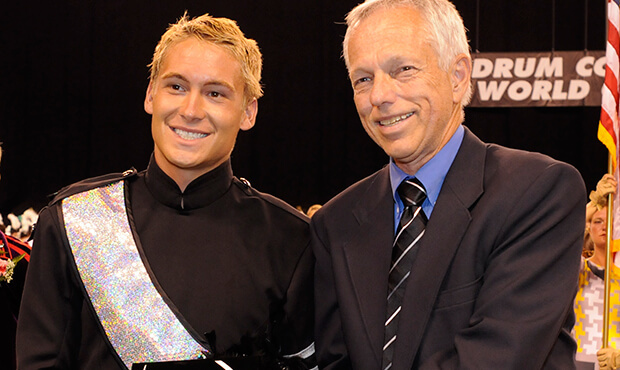 David Warren from Phantom Regiment and John Filippone from Genesis received the 2014 Jim Jones Leadership Award, named in honor of the former director of the Troopers and founding member of DCI who passed away in 1994. The award is given each year to one World and one Open Class drum major who exhibit unparalleled leadership qualities and conducting skills. Selections are made by a committee of DCI Hall of Fame members. Warren, 20, is the fifth drum major from Phantom Regiment since 2000 that has won the award and follows in the footsteps of former Regiment conductor Dean Patterson who received the scholarship in 2013. "I'm very honored," Warren said during the finale of the DCI World Championship Finals. "There have been a lot of fantastic drum majors to win this award and it's an incredible feeling. I'm very humbled." DCI Hall of Fame member Gene Monterastelli presents David Warren the 2014 Jim Jones Leadership Award. A music education major at Berry College in Mount Berry, Georgia, Warren served as the assistant conductor with Phantom Regiment in 2012 and 2013 before taking the head position in 2014. He credits much of his success to his predecessor. "Working with Dean Patterson the last couple summers has meant a lot to me," Warren said. "I really learned a lot from him, and I wouldn't be anywhere I am today without him." Filippone is the first Genesis member to ever be presented the Jim Jones Award, and 2014 marked his first summer ascending the podium as drum major. He joined the Open Class corps from Austin as a mellophone player in 2011. A Texas native, Filippone attends the University of Texas at Austin where he studies computer science. 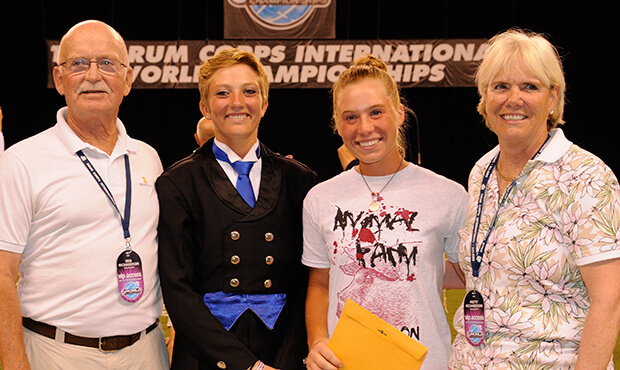 Other honors given out during the 2014 World Championships included the 27th Lancers Foundation's George and Patsy Bonfiglio Scholarship, which went to Alyson Downs of the Troopers and Joshua Jenkins of Carolina Crown. The Netherlands' best and brightest are honored at the DCI World Championship Semifinals. 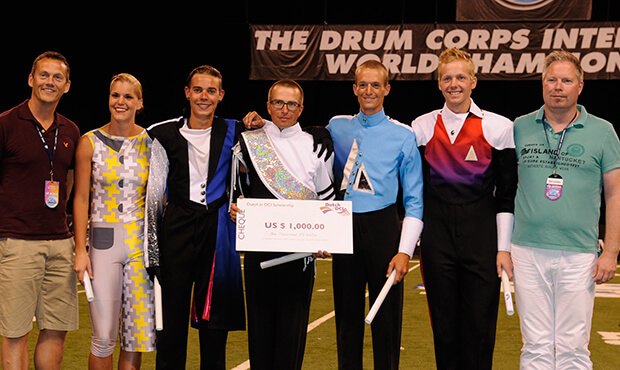 The Dutch in DCI Foundation, started in 2006 to support talented young performers from the Netherlands who participate in DCI corps, awarded four $1,000 scholarships to five individuals. Fifth-year Colts baritone player Erwin de Jong, second-year Spirit of Atlanta bass drummer Maarten van Walraven, Phantom Regiment mellophone player Anton Buitendijk, Blue Devils trumpeter Koen Otten and Cadets color guard member Andrea Boot were all honored. The Jim Ott Scholarship, given each year by the California nonprofit organization Sponsors of Musical Enrichment, celebrates a drum corps member pursuing higher education in the music field and who demonstrates leadership qualities. The 2014 scholarship was awarded to Carter Taylor of the Cavaliers. Taylor was the dual recipient of the Friends of DCI Scholarship, which is given out annually to corps members to use toward college tuition and fees. After an application process that required answering essay questions and providing letters of recommendation, a panel of Friends of DCI members selects the recipients, who also included Ben Bulak from the Blue Stars. Patty and Ken Richardson present scholarships to Sierra Rogers (The Academy) and Ruth Williams (Boston Crusaders). Also administered by the Friends of DCI program, the Richardson's Scholarship, given to members who are pursuing a degree in music education, was awarded to Ruth Williams from the Boston Crusaders and Sierra Rogers from the Academy. Awarded for the first time this summer, the Fred J. Miller Memorial Music Education Scholarship was presented to Crossmen drum major Caitlin Hall. Rounding out the Semifinals ceremony were two new scholarships presented in honor of DCI Hall of Fame members who passed away in the last year. The Rodney Goodhart Memorial Scholarship was awarded to Riley Warren of the Cadets and the Gary Czapinski Memorial Scholarship was awarded to Spirit of Atlanta drum major Jacqie Rotch.